Who wants cleaner, brighter, shinier toilets? And all the moms said, "I DO!" Especially the moms with little boys. Yikes. Long gone are the days of cleaning the bathroom only once a week. No. Daily my kid's bathroom needs to be checked (of course I didn't say I'm always on top of that). Sometimes everything inside of me wants to avoid it because honestly, I'm scared of what I'll find. 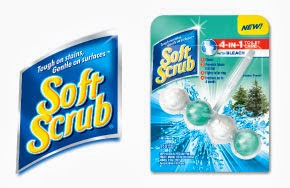 When I saw that Soft Scrub's 4-in-1 toilet care was up for review, I was excited. What I like about this toilet care product is that it fits right on the rim of the toilet, under the seat. I can't stand the ones that you have to open that heavy lid on top of the toilet. I don't know, it just seems gross to me and I'm always afraid I'm going to drop and crack it. This is much easier and you can actually see it working. Every time you flush, the water runs through the product causing it to clean, prevent build-up, prevent toilet ring and stays fresh for up to 4 weeks! Disclaimer: I received the above product free for the purpose of this review. All opinions expressed are my own. The toilet is the worst here. My least favorite is cleaning the shower. Hate it. I hate cleaning the bathtub! Cleaning the bathroom is my least favorite especially the toilet! Thanks for the giveaway…cleaning our tile shower stalls is a real chore !